Too much sunlight can be dangerous. Being outside on a warm, sunny day is one of life's great pleasures, but getting too much sun can be dangerous. 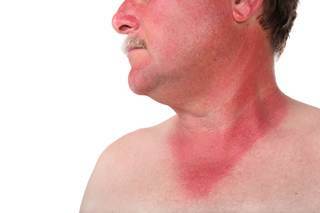 Excessive sun exposure can result in painful sunburn, but can also lead to other serious health problems, including melanoma, a life-threatening form of skin cancer. Melanoma is one of the fastest-growing forms of cancer in the U.S. New melanoma cases in the U.S. have more than doubled over the past two decades, with an estimated 6,900 American deaths from the disease in 1994. In addition to melanoma, excessive UV exposure can lead to premature aging of the skin, cataracts, non-melanoma skin cancers, and immune system suppression. Special Considerations for Children: Although many of the sun's worst effects do not appear until later in life, recent medical research has shown that it is very important to protect children and teenagers from overexposure to UV radiation. The majority of most people's sun exposure occurs before age 20, and studies increasingly suggest a link between early exposure and skin cancer as an adult. The following precautions can help ensure that you and the children around you avoid UV-related health problems, both now and later in life. Started early, each of these steps will become an easy habit to help you along. ¶. Avoid the Midday Sun as Much as Possible. The sun's UV rays are strongest between 10 a.m. and 4 p.m. To the extent you can, limit exposure to the sun during these hours. Try to plan your outdoor activities for the early morning of late afternoon. ·. Wear a Hat. A hat with a wide brim offers good sun protection to your eyes, ears, face, and the back of your neck - areas particularly prone to overexposure to the sun. Wear long-sleeved shirts and long pants when out in the sun. Choose tightly-woven materials for greater protection from the sun's rays. ¸. Apply a Sunscreen before every exposure to the sun, and reapply frequently and liberally, at least every two hours, as long as you stay in the sun. Even waterproof sunscreen can come off when you towel off sweat or water. The sunscreen should always be reapplied after swimming or perspiring heavily, since products differ in their degrees of water resistance. Dr. Jacobs recommends sunscreen with an SPF (sun protection factor) of 15 or more printed on the label. 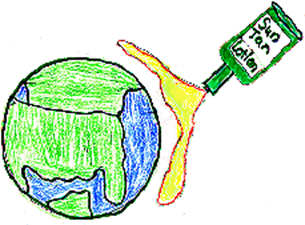 Use a sunscreen during high altitude activities such as mountain climbing and skiing. At high altitudes, where there is less atmosphere to absorb the sun's rays. Don't forget to use your sunscreen on overcast days. The sun's rays can be as damaging to your skin on cloudy days as they are on sunny days. Individuals at high risk for skin cancer (outdoor workers, fair-skinned individuals, and persons who have already had skin cancer) should apply sunscreen daily. ¹. Wear Sunglasses that Block 99-100% of UV Radiation. Sunglasses that provide 99-100% UVB protection will greatly reduce sun exposure that can lead to cataracts and other eye damage. Check the label when buying sunglasses. º. Photosensitivity an increased sensitivity to sun exposure is a possible side effect of certain medications, drugs, cosmetics, and birth control pills. You may need to take extra precautions. Ï. 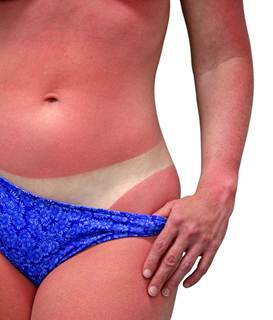 If you develop and allergic reaction to your sunscreen, change sunscreens. Try PABA free. ¼. Beware of Reflective Surfaces! 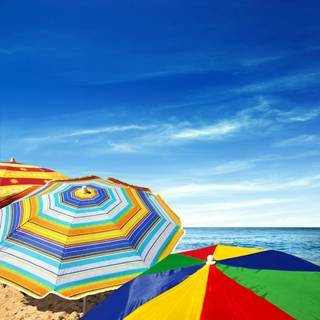 Sand, snow, concrete, and water can reflect more than half the sun's rays onto your skin. Sitting in the shade does not guarantee protection from sunburn. ½. Avoid Tanning Parlors. Sunlamps damage the skin and unprotected eyes and are best avoided entirely. 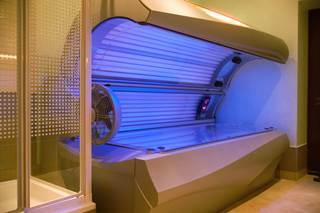 The UV light emitted by tanning booths causes sunburn and premature aging, and increases your risk of developing skin cancer. Ò. Protect Children! Keep young infants out of the sun. Begin using sunscreens on children at six months of age, and then allow sun exposure only with moderation. Teach your children sun protection early. 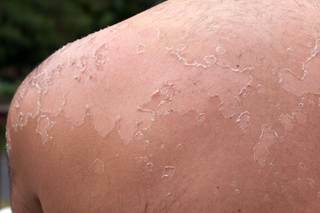 Sun damage occurs with each unprotected sun exposure and accumulates over the course of a lifetime. ¿. Watch for the UV Index. The UV Index, developed by the National Weather Service and the Environmental Protection Agency, provides a forecast of the expected risk of overexposure to the sun and indicates the degree of caution you should take when working, playing, or exercising outdoors. The UV Index predicts exposure levels on a 0-10+ scale, where 0 indicates a low risk of overexposure, and 10+ means a very high risk of overexposure. Calculated on a next-day basis for dozens of cities across the U.S. by the National Weather Service, the UV Index takes into account clouds and other local conditions that affect the amount of UV radiation reaching the ground across the country.